“I’m growing a moustache for charity” announces Tim Wheeler. “So now I look like Freddie Mercury. DAY-OH!” “DAAAYYY-OOOHHHH!” we all shout in unison. Nope, you certainly don’t come to an Ash gig for heart-on-sleeve emoting, mindblowing musical innovation or quasi-religious experiences. What you do come for is to jump around like a loon, sing yourself hoarse and spend just short of two hours with a huge grin on your face, and sometimes – particularly after three days at a noise/techno/psych fest followed by two days of hung over listlessness – that’s exactly what you need. 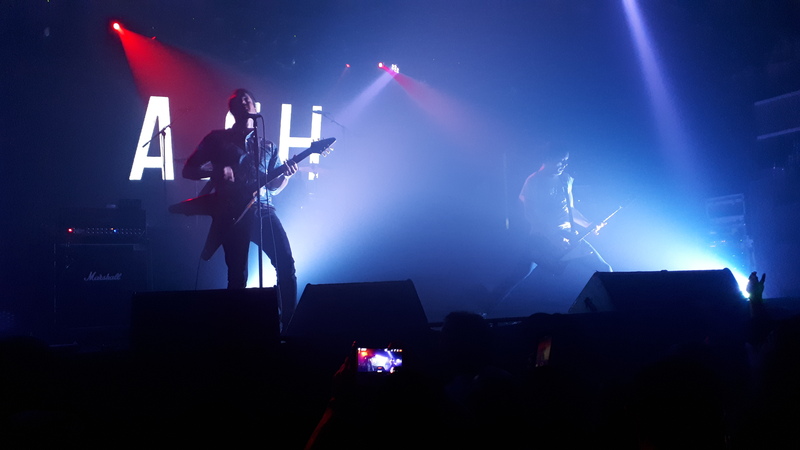 Foreign bands rarely visit Bangkok; this is Ash’s third gig here so Bangkok gives them a touchingly hysterical welcome, and the hysteria continues throughout. Thai audiences tend to be somewhat demure but Ash elicit the kind of response usually reserved for Korean boy bands or anti-government protests. But when you’ve got that many killer tunes, no other response is possible – if your answer to the question “What are the best singles compilations ever?” doesn’t include Intergalactic Sonic 7s, you’re a wrong ‘un and no mistake, and we get most of those singles tonight. And the new stuff is just as good, so when Wheeler announces that they’re going to play a couple of songs off new album Islands, there’s no rush for the bar or the bog, with the sparky powerpop of ‘True Story’, the Weezerish (when that was a compliment) ‘Annabel’ and the bouncy contemporary pop of ‘Confessions in the Pool’ more than holding their own alongside early outings for a frenzied ‘Kung Fu’ and a mass singalong for ‘Oh Yeah’. But it’s mid-set where things really take off, as Ash tear through ‘A Life Less Ordinary’, ‘Goldfinger’ (oh my god, ‘Goldfinger’. Did anyone write a better song in the 90s? They probably did but right now it feels like they didn’t), ‘Walking Barefoot’ and ‘Shining Light’ in succession; and it hits you just how bittersweet these songs are, that even as an 18-year old Wheeler realised that young love & teenage summers were purely ephemeral, not made to last, yet turned that premature sense of nostalgia into some of the most euphoric indie-rock songs ever recorded. Though whether it’s appropriate for a 41-year old man, however sickeningly youthful he may still look, to be singing “Warm June evenings, she would come to my house/Still in a school skirt and a summer blouse” is debatable. Ash self-mockingly look back on those early tunes on new song ‘Buzzkill’ – “Summer’s here, now the summer’s gone – BUZZKILL!”, one of the best songs they’ve recorded in years, then round things off with an ecstatically received ‘Girl From Mars’ (and oh how we all join in on the “I still love you…the girl from…………………………MARS!! !” bit) and, of course, ‘Burn Baby Burn’; then return to give us a very generous five encores, finishing with a blistering ‘Lose Control’. Those youthful summers may be long gone, but an evening with Ash has me feeling like a teenager again. Apart from the dodgy knees, but enough about them.